The third-generation Volkswagen Touareg is quiet and smooth on the road, and comes with an impressively powerful engine and lots of advanced technology. A modern look and roomy cabin should make it popular with business and family buyers alike, even if it lacks the option of seven seats. Interested in buying a Volkswagen Touareg? The overall shape of the latest Touareg follows that of its predecessor, but the designers have brought the detailing right up to date. Thankfully, even though it’s a little longer and wider than before, it can still fit into a standard parking space with room to spare. Up front, there’s a grille design that incorporates the headlights. At a quick glance, you could say it has a whiff of Audi about it, which won’t harm its prospects. As the Touareg is strictly a five-seater (with no plans to make a seven-seat version), it isn’t as boxy at the rear as, say, a Volvo XC90. Wheel sizes for the Touareg range from 18 to 21 inches and, in addition to the standard SEL model, there are two sportier looking R-Line versions; R-Line and R-Line Tech. Sticking to a five-seat configuration means a particularly roomy cabin, while opting for a lighter upholstery colour makes it feel even more spacious inside. The electrically adjustable front seats are heated and can be equipped with ventilation and massage functions. However, the latter isn’t available on the sportier R-Line chairs. Setting the Touareg apart from its rivals is Volkswagen’s new Innovision dashboard display, which is standard on the top-of-the-range R-Line Tech model and optional on all the others. 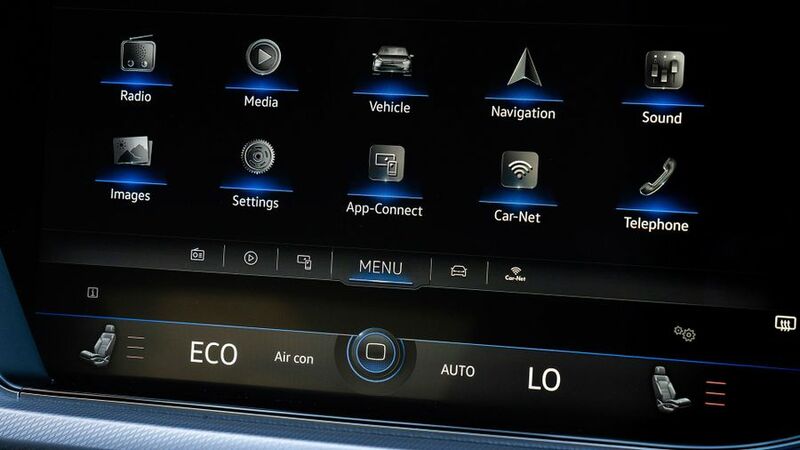 Combining a 12.0-inch instrument display with a huge 15.0-inch infotainment touchscreen system, behind what appears to be one single piece of glass, it looks highly impressive. You can also configure the layout and functionality of the system to your heart's content, which some will find exhilarating and some will find bamboozling. In any case, it'll take some getting used to. 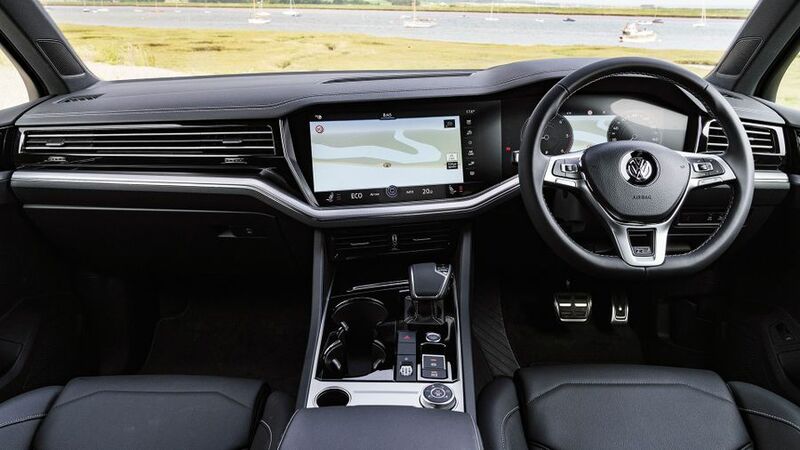 Other cars will have, as standard, a less fancy but still decently-proportioned 9.2-inch touchscreen with a more conventional analogue instrument panel. The quality throughout the rest of the cabin is generally very good, if not quite good enough to put the Touareg in the same league as more established premium models like the Audi Q7; there are one or two places where the finishes and textures just aren't quite as special. An optional panoramic glass sunroof is the largest that Volkswagen has fitted to a car, more than a metre long, flooding the cabin with light and adding further to the spacious feel. The Touareg may not make some buyers’ shortlists due to its lack of a seven-seat option, but what it lacks in people-carrying ability it more than makes up for with its load-lugging capability. 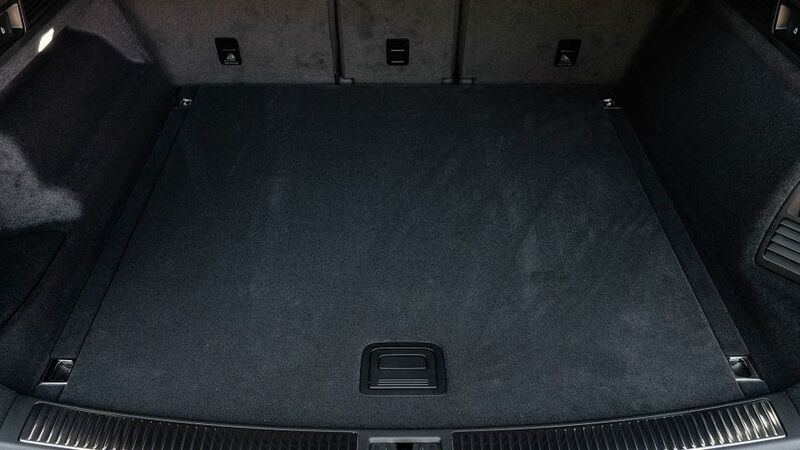 The boot space is 697 litres, but can be increased to 810 litres by sliding the rear seat bench forward. Fold down the rear seats and you’ll have a whopping 1,800 litres of cargo volume at your disposal. There are hooks mounted in the side of the boot to hold things like shopping bags, although we'd like to see a few more ways of securing smaller items. Throughout the rest of the cabin you won’t have to reach far to find useful storage areas, either. Deep door bins, a decent-sized glovebox and a compartment under the centre armrest means you won’t have a cluttered cabin. A wireless charging pad in the centre console is easily accessible and there’s also a 12-volt socket and up to four USB charging ports available throughout the car. Volkswagen even had room left for two large cupholders in the centre console. The Touareg should prove popular with those that tow trailers or caravans thanks to its ability to pull up to 3.5 tonnes. 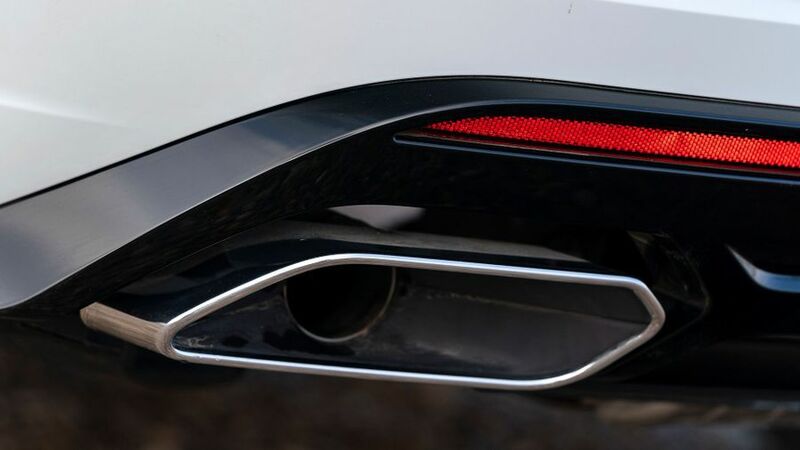 Added to this, Volkswagen offers an electrically retractable tow bar that neatly folds under the bumper and out of sight at the touch of a button. 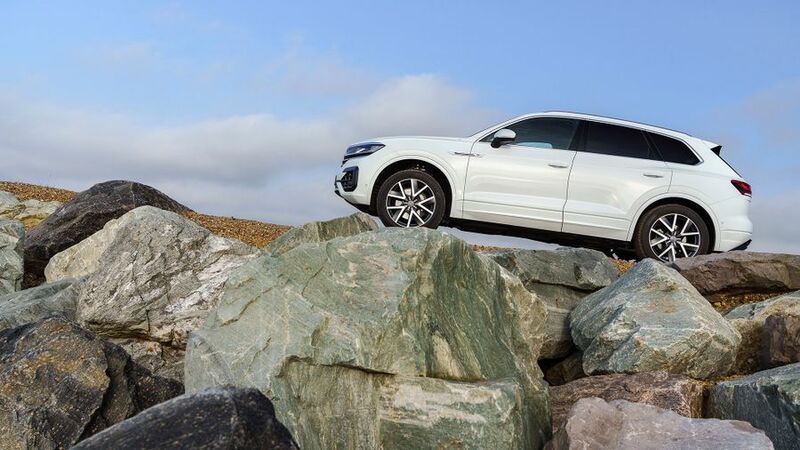 Stick with the Touareg's standard suspension, and you'll be largely satisfied. Admittedly, the low-speed ride can feel a little unsettled from time to time, but it's nothing that's going to annoy you, and things even out nicely as you go faster. This is a car that's most at home munching through massive motorway distances, and the excellent suppression of exterior noises also helps on that score. 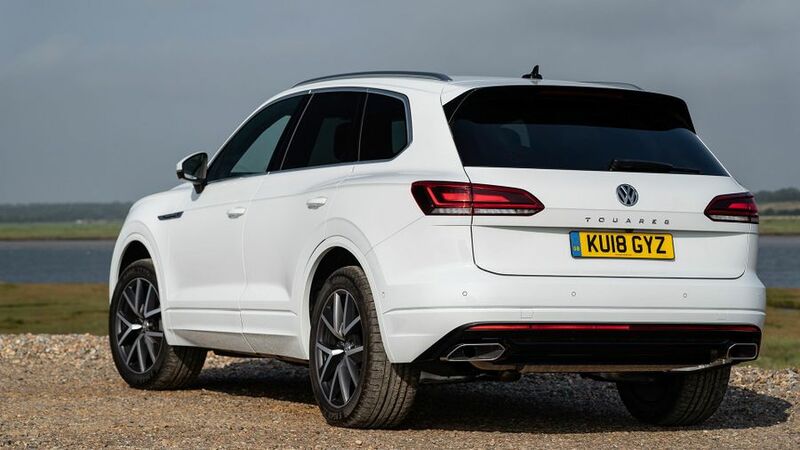 We’ve also tried Touaregs fitted with the optional adaptive air suspension, which includes a clever system that stops the car rolling and leaning through the bends. Five selectable driving profiles slightly alter how the suspension - as well as the throttle and steering - behaves. In its most comfortable mode it’ll set itself up to better absorb bumps, while switching to Sport mode firms things up. It’s very effective and also delivers good ride comfort, although it's perhaps not as cloud-like as you might expect. You'll still be aware of imperfections in the road. Optionally, a rear-wheel-steering system enables even tighter turning circles by rotating the rear wheels in the opposite direction to the front wheels by up to five degrees at slow speeds. When moving faster, the rear wheels turn in phase with the fronts to allow, for example, for more stable lane changes. There are three choices of 3.0-litre V6 engine in the Touareg, one of which is a petrol and two of which are diesels. All have permanent four-wheel drive. We’ve yet to try the petrol – which has 340 horsepower – but we’ve had a go in both of the diesels. The entry-level version has 231 horsepower, which is enough for plenty of grunt and acceleration. For most people, we suspect this will more than enough performance. 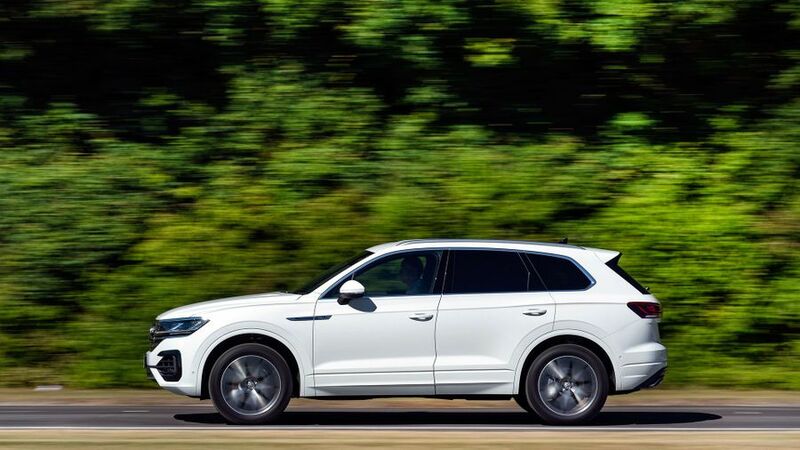 If you do need more oomph however, the other diesel has 286 horsepower, which makes the Touareg very brisk indeed, and with bags of low-down muscle, the car feels ready to pick up its skirts and go whenever the need arises. The power delivery in both diesels is silky smooth, as are the changes from the automatic gearbox, and the correct gear is usually selected first time as well. 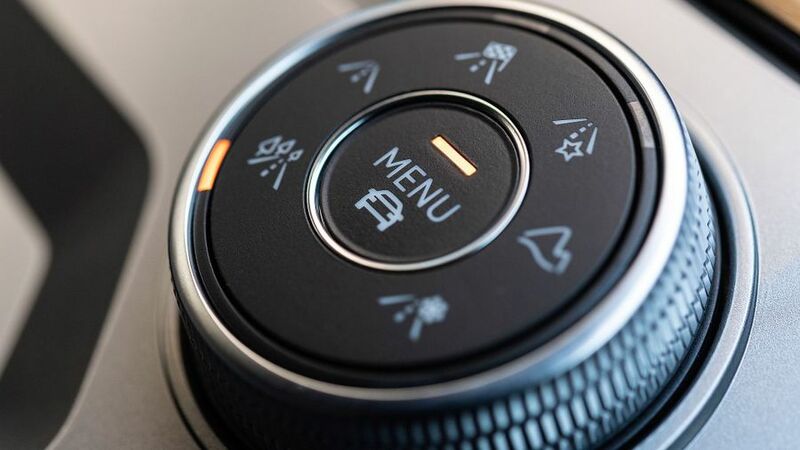 You can opt to shift manually using the steering-wheel paddles, we think the eight-speed auto gearbox is best left alone to do the shifting for you. 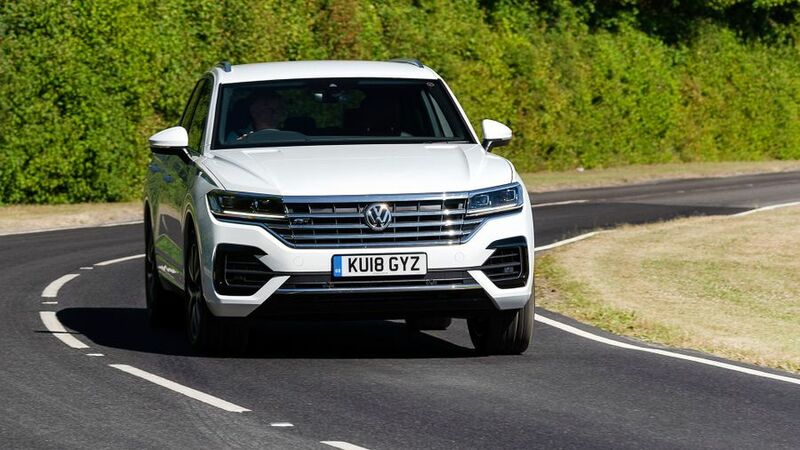 The Touareg costs a decent slice less than rivals from arguably more prestigious brands like Audi, BMW, Mercedes-Benz and Porsche, although in some cases, the differences in cost might not be as great as you might think; this is still an expensive car to buy. That said, resale values are on a par with those of its rivals, so you won’t lose out too much when the time comes to sell the car on. Fuel economy and CO2 emissions are very competitive when compared with the equivalent versions of rivals, too. Servicing and maintenance costs also look very competitive, although insurance groupings are nothing special. Being an entirely new car, which also features a significant amount of technology, it’s too soon to say just what kind of reliability to expect from the new Touareg. A look at Warranty Direct’s Reliability Index puts Volkswagen solidly mid-table in the manufacturer rankings, while JD Power’s 2018 Vehicle Dependability Study ranks them similarly, with a better-than-average score. All new cars from Volkswagen UK come with a three-year warranty, though only the first two years have unlimited mileage; the third year has a 60,000-mile limitation. When that expires there is the option to purchase warranty coverage for additional years and higher mileages. At the original point of purchase, an extended factory warranty is also available. The Volkswagen Touareg scored the maximum five stars in crash tests by safety organisation Euro NCAP. Standard safety equipment across the board includes six airbags, an active bonnet for better protection of pedestrians and a system that locks on the brakes after an accident to help prevent further collisions. Automatic emergency braking is also standard fare, along with adaptive cruise control, traffic sign recognition and a system to warn you if you’re found to be wandering out of your lane. There’s a whole heap of other clever safety stuff available if you’re prepared to pay extra, too. That includes night vision, intelligent headlights that bend their beams around oncoming cars and a system that’ll effectively drive the car for you in traffic. Even the entry-level SEL Touareg comes absolutely stacked with luxury kit including heated leather seats, two-zone climate control, four powered windows, automatic lights and wipers, and an all-singing infotainment system with navigation, DAB, Bluetooth, a 64GB hard drive, Apple CarPlay, Android Auto and a host of apps and connected services. The upgrades you get on R-Line models are largely cosmetic, but you do get more USB ports and wireless phone charging, along with a powered tailgate, four-zone climate control and a parking assistant. The R-Line Tech adds in the massive digital screens with upgraded infotainment functionality, keyless entry and electric seat adjustment. The Touareg pits Volkswagen against familiar premium models from brands like Audi, BMW, Mercedes and Volvo, and the big Volkswagen is far from disgraced. The Touareg’s styling is modern without being in-your-face and it looks highly desirable. It might not be the comfiest or the sportiest car of its type to drive, but the Touareg is very competent on the road and eats up distance with ease. Then there’s that fabulous interior, with so much technology on offer that you’re unlikely to want to get out of it.